Steve Schlossstein is an internationally acclaimed author, former business executive with J. P. Morgan and past strategy consultant with extensive experience in global markets, trend analysis and strategic planning. His particular professional expertise is in the Far East business and commercial markets. 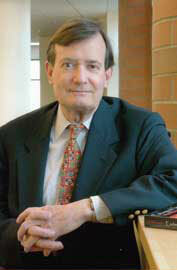 As an accomplished author, Mr. Schlossstein wrote the highly acclaimed The End of the American Century (1989) and Trade War (“Greed, Power, and Industrial Policy on Opposite Sides of the Pacific”), an American Library Association “Best Business Book” of 1984 and a bestseller in the Japanese edition (1985). He has written two novels dealing with the business environment and social change in Japan: Kensei (“The Sword Master,” 1983, an Avon bestseller in the US) and Yakuza (“The Japanese Godfather,” 1990), about the Japanese underworld. His fifth book, Asia's New Little Dragons (“The Dynamic Emergence of Indonesia, Thailand, and Malaysia”), was published in 1991. His sixth book and third novel, The Jiangxi Virus, appeared in 2002; it is a complex tale of bioterror in which a rogue colonel in the Chinese Army threatens the United States with a lethal virus. In 2004, he released a cyberspace thriller set in New York dealing with deadly threats from the Russian Mafia and Internet fraud titled crime.com, which was the first in the Peter Dawkins series. In 2005, he published a new non-fiction work (his last) about Islam’s failed economic strategies titled Endangered Species: Why Muslim Economies Fail, with lessons for the Middle East from East Asia’s dynamic transformation. In 2007, he completed a long historical novel titled Dreams Denied, set in Charleston, S.C., in 1866, during Reconstruction. In 2009, he published a novel about political corruption in modern Africa, set in Nigeria and New York, titled The Black Widow, the second in the Peter Dawkins series. In 2010, he released his third Peter Dawkins novel, about murder on the deadly intersection of American politics and religion, titled Do Unto Others, currently under development as a screenplay. In fall 2011, a collection of his recent essays, which he wrote originally in Japanese, appeared in Tokyo as 城石放送協会 (Shiroishi Hōsō Kyōkai, the Schlossstein Broadcasting Network). His English-language translation of this work appeared here in 2012 as Moving Violations: A Contrarian Coda. In late 2012, he compiled and edited a collection of humor titled Facetiae. His newest book is a comic novel of aging and death titled Twilight Ridge (“Drop In. Drop Out. Drop Dead.”), the screenplay for which is done and copyrighted. His columns and articles have appeared over the years in The New York Times, The Los Angeles Times, The Dallas Morning News, The Trenton Times, The Chicago Tribune, Business Tokyo and International Economy. In his role as strategy consultant, Mr. Schlossstein’s last client was the Sarnoff Corporation of Princeton. He served as Sarnoff’s Senior Advisor International, with authority and responsibility for its global business, which he quadrupled during his 4-year consulting assignment there. In 1995, he was co-founder, President and CEO of the Interactive Health Network, Inc. [HealthNet], a joint venture with Sarnoff that developed a working prototype for enhanced medical and health information in digital video format targeted at then-emerging interactive television (ITV) systems. While at Sarnoff, Mr. Schlossstein managed a wide range of new applications for Asian corporate clients in the fields of solid-state technologies, telecommunications, computing, information technology, advanced display systems and the Internet. He was profiled in a special issue of Fortune magazine in August, 1991, as one of “25 Americans who help the U.S. win,” and was featured in a lengthy review of interactive technology in The New York Times on September 7, 1994. An active public speaker at corporate meetings, conferences and conventions during his business career, he was a client of the Keppler Associates speakers bureau of Washington. Since 1982, as founder and president of his Princeton-based strategy consulting firm, SBS Associates, he designed, negotiated, and implemented strategic assignments for American corporations in the Far East. He has particular expertise in the dynamic East Asian markets, from Japan, Korea, and Taiwan in northeast Asia to Singapore, Thailand, and Indonesia in Southeast Asia, as well as in the advanced economies of the European Union. From 1969 to 1982, Mr. Schlossstein was an executive with J. P. Morgan & Co. of New York, with assignments in New York 1969~71; in Hong Kong as representative 1971~72; in Tokyo, from 1973~77 as vice president for corporate business development; and in Düsseldorf, Germany, from 1977~80 as vice president and general manager. (He was Morgan’s youngest-ever overseas representative and foreign branch manager.) Back in New York from 1980~82, he was the vice president of Morgan's merger and acquisition department responsible for new business in Japan and East Asia, and achieved some of the first acquisitions by Japanese firms in the U.S. market at that time. Born in 1941, Mr. Schlossstein received a B.A. in history and philosophy from Austin College in Texas in 1963; he was its distinguished alumnus in 1990. He did graduate work at the East-West Center, University of Hawaii, 1964~66, including work under Prof. Hisaharu Kugimoto of Tokyo University, completing an M.A. program in Japanese history. In 1984, he completed the Advanced Management Program at Columbia Business School. He speaks and reads fluent Japanese and German and has passed the Foreign Service Institute's Advanced Course in French (Niveau Supérieur 2). Steve resides in Princeton with his wife, Martha; they are the parents of two adopted Korean children, Claire (30) and Peter (29) and are active supporters of the arts in New York and Philadelphia. He is a former member of the Princeton Public School Board (1987~89); a past candidate for the New Jersey State Legislature (1991); a former board member of the Advisory Council of the Department of East Asian Studies, Princeton University (2002~06); a past board member of the Princeton Public Library Foundation (2004~06) and a charter member of its Expansion Committee (1989); a former benefactor of the Manhattan Institute in New York; a former fellow of the Foreign Policy Research Institute of Philadelphia; a benefactor and former Board Member of the Mercer Street Friends Center in Trenton, New Jersey; a former Leadership Council Member of the Princeton Medical Center Foundation; a benefactor of Spence-Chapin Services to Families and Children, New York; and a past benefactor of the Seattle Biomedical Research Institute (SBRI), which has recently won patents for its genetically attenuated sporozoite vaccine, a leading candidate in the race to eliminate malaria. He is a member of the University Club of New York City, which has the largest private library in the United States.